Omar, Charlie and I have recently returned from the Australasian Rogaining Championships (10-11 October 2015), where we were fortunate to receive Nigel Aylott Memorial Sports Foundation funding to represent the University of Tasmania in the Intervarsity component of this event. Having not competed together in an event like this before, we headed off to a night orienteering event near Hobart for some training. This was great in confirming that we would be alright if lost together in the bush at night, as we never quite found the first control but had a really good time all the same. Given our limited team experience with night navigation we decided to plan for off track routes during the day and track routes during the night. This worked out really well, as we could keep up a good pace through the night. At some point in the early morning we decided to have a short nap under a space blanket, assuming that we’d soon get cold and uncomfortable and then be on our way. Surprisingly, we discovered we could nap relatively comfortably huddled up in a space blanket cocoon, so our short nap lasted a couple of hours longer than anticipated. With less than hour to go we had one final decision – finish a bit early or continue straight through the Hash House to a control past it for an extra 30 points. As it turned out getting this control was the right decision, as we beat another intervarsity team by 20 points to place second out of nine teams in the intervarsity competition. Overall we placed 41 out of 143 teams in the Australasian Championships. 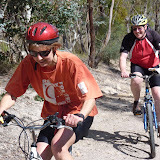 Dry, fast paths and comfortable walking weather provided a base from which seventy two people enjoyed riding or walking the Sandford area in the latest MTBNav-Bush event held on 1st March 2015. Organisers Keith Carroll and Mark Hey had created a course using forty eight controls where participants needed to visit sites to find the right answer to a question given three options. After four hours of traverse, in the Female Foot division the first two Teams arrived back at the Hash House with 510 points each. While the Team of Rosie Rutledge, Robyn Chapman and Adele Winslow focused mainly east and west from the Hash House and south of Rifle Range Road, that of Liz Canning and Dorothy Steane ventured into the maze of bike tracks on private property between Dixon Point Road and Dorans Road. Both Teams visited twelve controls. Well done ladies. Most traveled Team in the event was that of Gordon Taylor, Paul Kleywegt, Jules Evans and Lester Dion in the Male Bike who in fours hours visited thirty nine controls at all points of the compass. Dorans Road was the main area they bypassed, along with a few controls in the Clifton Beach area. A very solid ride, and one that compares with the thirty three controls visited by second placed Team Jeff Dunn and Jemery Day. The next seven Teams in Male Bike also scored high points, indicating a high depth of capability. Mixed Bike over four hours also provided a close finish with Sophie Marshall and James Hattam just 110 points ahead of Sally Wayte and Lindsay Pender. While there were only two Teams in Female Bike, Karen Wild-Allen and Rachel Allen ended up just 150 points to the good of Nadine Rowell, Helen Burford and Nicole Carter. In Male Foot, the youngsters Dexter Canning and Tarn Leith, assisted by Dexter’s dad Hugh, achieved a ninety point advantage over the mature Team of Ross Kelly, Ian Woolford and Rob Hunter. Running solo and unofficial in this category, Andrew Mackay once again displayed his running prowess by gaining almost twice the points of the leading Team. In the two hour event, Graham Sargison and Renny Duckett in Male Bike and Diana Cossar-Burgess and Sebastian Burgess in Mixed Bike were the only entries, and both Teams enjoyed solid rides mainly in the area to the south west of the Hash House. When it came to tallying the points, a gremlin was encountered in that an earlier version of the QnA had been printed inadvertently, meaning that the answer sheet contained four incorrect answers. Thus those questions were marked as incorrect when in fact they were correct. Presentations were based on the erroneous values, and made subject to later validation given there was not the time to redo the figures on the spot. Keith and I apologise to those affected, which mainly means Male Bike where there was a remix of the first seven placings. In the end, the original Male Bike winners of Gordon Keith and Glenn Hyland moved to fourth, and the original runners-up of Gordon Taylor, Paul Kleywegt, Jules Evans and Lester Dion gained first place. Jemery Day and Jeff Dunn moved from fourth to third. Phil Tracey and Ewan McIvor remained third. Mixed Bike were also affected by the corrected points tally in that third to fifth position finishers were rearranged. First and Second remained unchanged, as did the placings in all other categories. At the conclusion of the event, a lovely afternoon tea was provided by Gayle West and the Orienteering Tasmania Juniors, and spot prizes were drawn being vouchers and merchandise provided by Ride Bellerive. Appreciation is also acknowledged to Andy Nuss and Jock Campbell for allowing access onto their respective properties. Keith and I are pleased the event was enjoyed by all those who participated, and we encourage you to reuse the map, excluding private property, for future rides or walks in the Sandford area. Event Results can be downloaded here. A field of seventy participants enjoyed riding or walking the trails of Sandford on Sunday 18/11/12 on a warm and dry spring day. The Team of Jeff Dunn, Jemery Day and Mike Fuller led home the Men's Four Hour MTB with 1610 points, just ten ahead of Jules Evans, Gordon Taylor, Paul Kleywegt and Roger Jackson. Both Teams visited 31 of the 32 controls, and both bypassed a thirty point control, though different ones. The difference was the ten points lost by the Jules Evans Team by finishing just 41 seconds after the time limit. In the Mixed Four Hour MTB Mike Dowling and Sue Hancock amassed 1150 points to be 360 points ahead of the next placed Team. Ian Hawkes and Colin Terry in the Four Hour Men's Foot also had a close win, on 570 points and just ten ahead of Ross Kelly and Julian Roscoe. These scores compare with the strong Teams in the Four Hour Mixed Foot where Sam Jarvis and Kelly Aitken gathered a huge 870 points and Amy Buckerfield and Stewart Lawrie just behind with an impressive 840 points. Full results from the event are on the Rogaining Tasmania website (Results). Thanks to private land owners Andy Nuss and Jock Campbell, to Ride Bellerive for supporting the event with prizes and promotion, to the Clifton riding Club for use of the arena, and to Orienteering Tasmania for the catering, loan of equipment and printing of maps. My appreciation to all those who entered, and to Gayle West for coordinating the magnificent afternoon tea obo the OT Juniors. There was a good turn up for the 2011 MTBNav Metro Foot and Bike event, and with the day looking like it was going to be bright and sunny, all looked set for a great event. In the three hour event, Dirk, Brodie, Ashley Nankervis and Louis Coad, managed to break the 1000 point barrier to amass a score that would have been credible in the six hour event, with Jarrah Day and Conrad Lindner coming in a very credible second. The rest of us mere mortals had a great time (thanks so much to Jeff, Darryl and the team). Finally at the top of Mornington Hill - ascended the hard way. We definitely go left here, or right ... it could be straight ahead. Despite the threatening weather of the day before a good crowd turned up for the 2011 MTBNav-Bush and Foot events out near Ellendale in Southern Tasmania. Warm congratulations go out to Darryl Smith and Grant Dixon for achieving first place overall in the Bike Male section of the MTBNav-Bush. They and the teams of Jon McComb and John Whittington, Matthew Patten and Ross Bugg, Jemery Day and Jeff Dunn, and Paul Pacque and Nigel Davies gained the maximum 1900 points in under four hours. Darryl and Grant were able to enjoy refreshments early with 59 minutes to spare. Just over 32 minutes separated the first five Teams, with Darryl and Grant home from Jon and John by 3.5 minutes, and then just 9 minutes to Matthew and Ross with Matthew riding single speed for some three hours after his derailleur disintegrated. Who needs gears? Two Teams went oh so close to gaining all 1900 points, that of Brendan Hey, Kari Eronen and John Alderdice gaining 1860 points, and that of Jules Evans and Roger Jackson finishing on 1830. In Mixed Bike the two Teams finished with only 70 points difference, John Dawson and Kim Harris heading David Loveridge and Marjorie Morgan. Marjorie managed to somehow destroy her saddle along the way, while John kept crashing and breaking various bits of his bike. In four hour Foot Male the juniors came to the fore as Brodie Nankervis and Jade Kerber showed everyone a clean pair of heals with 1610 points, leading Gary Carroll and Mike Fuller on 1450. Both Teams scored higher than some riding Teams, an outcome I was very pleased with because the course design included many short cuts available to walkers, but not to riders. It worked! Christine and David Marshall again demonstrated good route planning by amassing 1350 points in the Mixed Foot from Rod and Bev Miller, and in Foot Female, the three lady Team of Elizabeth Hey, Sarah Woods and Jennifer Hey achieved just 50 points more than the four lady team of Melanie Hawkes, Sue Kerr, Dorothy McCartney and Phillipa Terry. Well done to everyone who enjoyed the four hour event, including those who took a dip in the creek along the way. I trust bike repairs run smoothly. In the short and sharp two hour event, four of the five Teams contested the Bike Mixed category. Mike Dowling and Sue Hancock amassed 880 points to show Mark West and Cathy McComb a muddy wheel by only 60 points. Mike rode Sue’s bike, and Sue rode daughter Anna’s bike. John and Val Brammall were a mere 30 points back. Coming-in fourth were newcomers Helen Peters and Clinton Luckock who came along just to see how these events go. When I invited then to participate officially they didn’t hesitate, and did well seeing it was the first time they had ever seen a rogaining map. Please come again. Our sole Team in the Foot Female part of the two hour were two highly skilled junior orienteers in Anna Dowling and Nicola Marshall. With 610 points they really did demonstrate good route choice and covered the ground quickly. Well done to everyone who enjoyed the two hour event. Click here to download results. Saturday presented Robyn, Sally and I with a few showers as we placed the thirty-two controls and prepared the assembly area. At least we missed the heavy showers of the city. While it was looking a bit muddy for the event, the tracks still offered good riding, and the forests good walking. It was a relief of sorts when Sunday dawned dry with a near perfect temperature for rogaining. In planning the event I intentionally placed controls reasonably close so as to give Teams a lot of options with their course and have the navigation side need a bit more thinking to decide the optimum route. I wanted faster riding Teams to scoop the pool, and five did, and I wanted the walking Teams to be able to visit lots of controls. I thought the faster riding Teams might finish with half an hour to spare, but the first Team had nearly an hour up their sleeve, and the first four had over thirty minutes. I put this down to changes I made to the course – because of timber harvesting in the NW and SE parts of the map I shrunk the course area and removed four controls to avoid those spots. My personal thanks to Sally Wayte and Robyn Chapman for all the help on the Saturday and Sunday, and in the lead-up, to Gayle West and the mums of the OT Juniors for the wonderful refreshments at the conclusion, and to the many participants who helped collect controls and pack away the gear. Your support in those ways made my day more relaxing. Thanks also to Ride Bellerive for the support through vouchers and promotion, and to landowners Mr and Mrs Twinning, Norske Skog and Forestry Tasmania. I very much appreciated seeing those who came to the event from Launceston. And finally thanks to Orienteering Tasmania for the loan of the electronic and other gear and for the map printing. Our entry this year was 62 participants, two more than in 2010. It looks like the 2012 event will be on 18/11/12, but watch the Rogaining Tasmania website. Thanks for coming, hope washing the bike, clothes and yourselves went well, and hope to see you at an MTBNav next year.